I find myself in a very disconcerting situation. Until recently I was (very) strictly a one in, one out kind of girl when it comes to mascaras. Yet on my dressing table there are currently six open mascaras-they've even now got their own Muji acrylic pot. I need to thin it down-mascara should really only have a shelf life of three months when it's open and I've always been really strict on that-mainly because I am a mascara whore and always looking for the next best thing! I like my mascara very black, very volumising and very lengthening. As close to falsies without actually having to stick additional eyelashes on. So weird looking at six of your own right eyes at once. I think the reason I have six open currently is that none of these really wow me, apart from one. Here's a run down of my thoughts. 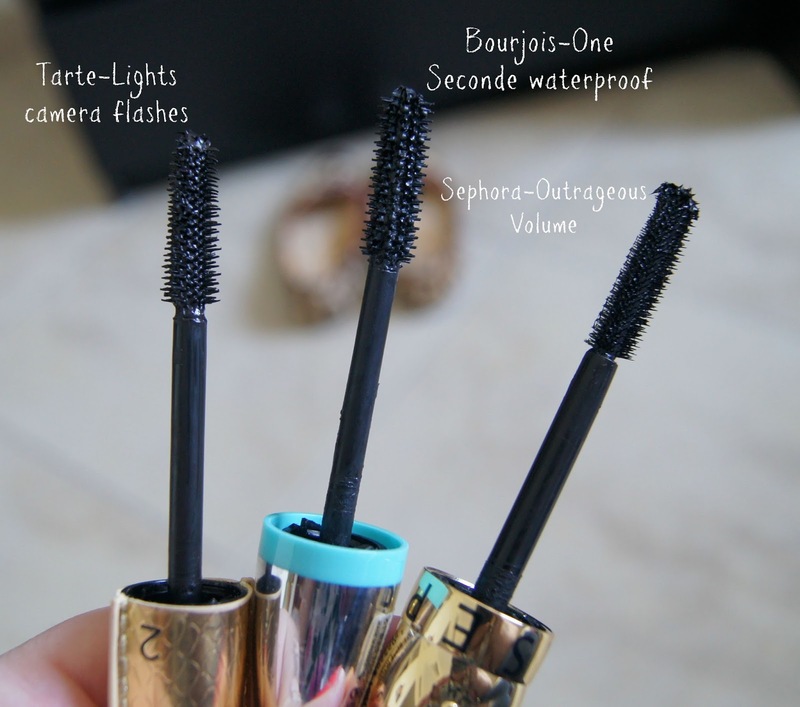 Bourjois One Seconde Waterproof-The worst of the bunch, I have been so disappointed with this mascara after expecting great things. It has a large plastic brush and the formula is quite dry. It's fine from the point of view of no flaking or smudging but it just doesn't give any oomph to my lashes. Even when I put about 5 layers on. If you like a nice natural look this mascara is for you. 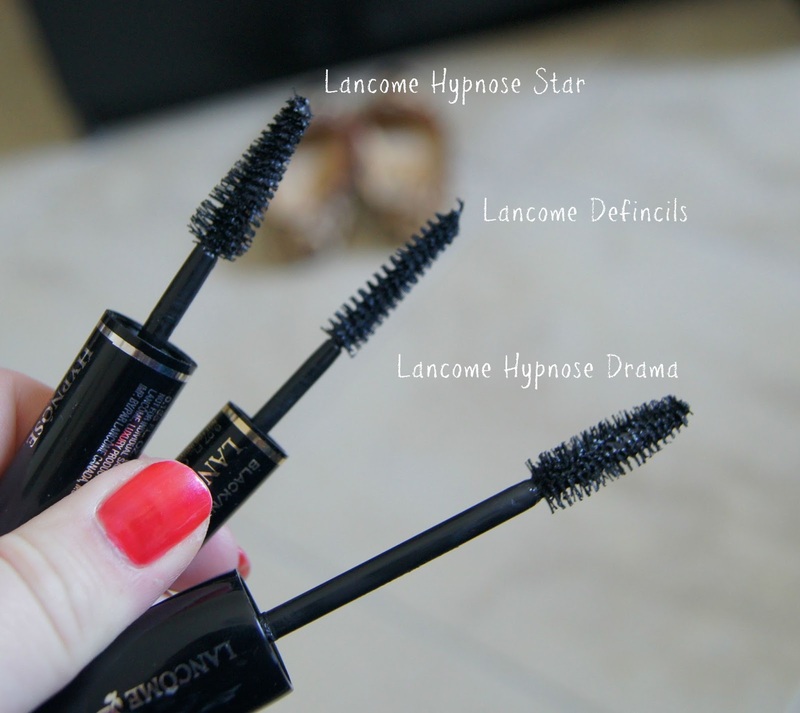 Lancome Hypnose Star-This used to be my all time fave mascara but this time I wasn't wowed. It has a cone shaped bristle wand which makes it easy to get into all the corners of your lashes and it adds more length than volume. I had a problem with this formula flaking and felt like I was constantly wiping away dots of mascara from my face. 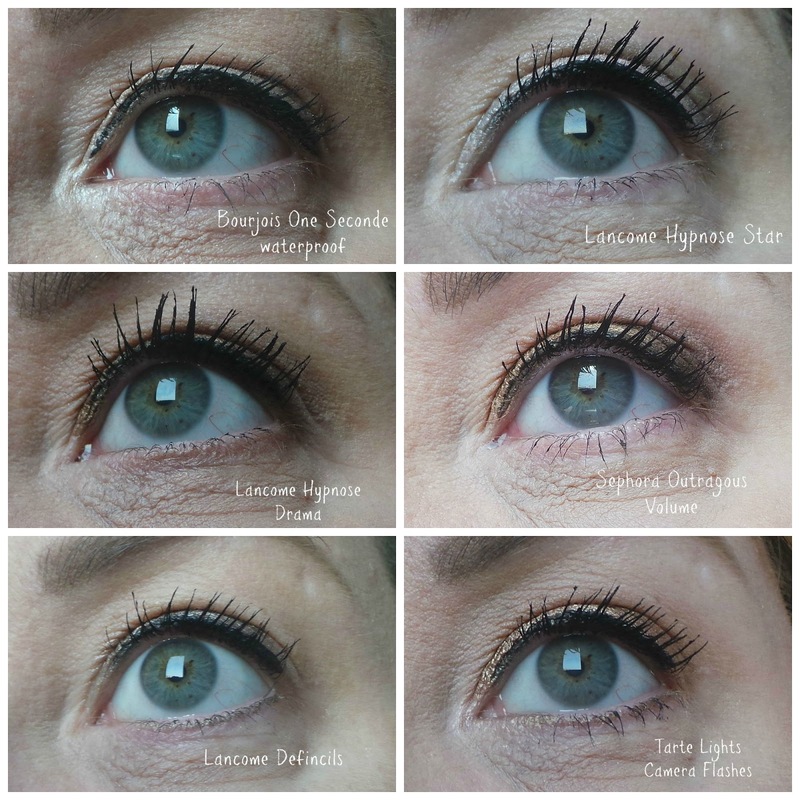 Lancome Hypnose Drama-The best of the six! This is probably the one that has been open the longest and it's still a pretty wet formula. it's very black and adds tons of volume and length. I really like the 'spoon' shaped bristle brush for combing through your lashes but I do advise wiping off the excess as it pulls out a lot of product. It doesn't fake or smudge and it stays super black all day. I also find it really lifts my lashes at the corners and never goes clumpy. I quite like the knobby plastic brush, it doesn't scratch my lashes and it gets into all the corners. It has a really wet formula so I always wipe off the excess but one layer adds length, two layers adds the volume and three layers is the start of clumpsville. Lancome Defincils-Another really good mascara, the thin wand makes it really easy to get right to the roots of my lashes. You can pile on loads of this mascara and still not get any clumps. It's best for separation and length. Tarte Lights Camera Flashes-I was really expecting big things from this mascara but it really hasn't lived up to my expectations. The plastic brush feels quite scratchy on my lashes but it claims to boost your lash volume by up to 752%. This seems like a very precise number to me. The brush has two sides to it-a side with shorter bristles you use first to coat the lashes and then one with longer bristles to maximise volume and separation. But I just don't feel it adds that much volume to my lashes-it's good, it's just not great. I'd love to know if you have tried any of these mascaras and your thoughts.